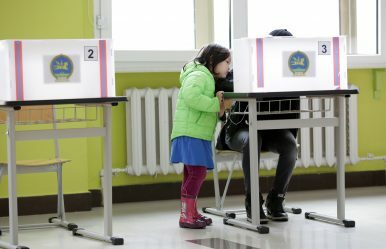 A daughter looks at her mother filling a ballot paper for the parliamentary elections at a polling station in downtown Ulaanbaatar, Mongolia (June 29, 2016). In one month, Mongolians head to the polls. Here’s what you need to know about the presidential race. On June 26, Mongolia will have its fifth presidential election. While all presidential elections are important, this election is significant in number of areas. As a country with a vast amount of natural resources, Mongolia is becoming an important destinations for foreign direct investment (FDI) as well as tourism. Meanwhile, as China’s influence increases in the region, Mongolia’s foreign policy must direct outward-led growth while maintaining economic security from extractive institutions. Given these trends, the next president’s ideals, ambitions, and qualifications will be crucial for determining the country’s future. The June 2017 election coincides with number of political changes in Mongolia. In early May, political parties narrowed down their presidential nominees. The current slate includes the chairman of the Parliament of Mongolia, Enkhbold Miyegombo from the Mongolian People’s Party (MPP); former MP Battulga Khaltmaa from the Democratic Party (DP); and former president of Mongolia, Enkhbayar Nambar from the Mongolian People’s Revolutionary Party (MPRP.) Although the Mongolian public expected these three candidates, public sentiment is skeptical on all three for a number of reasons. (Interestingly, former president N. Enkhbayar’s second run at the presidency was denied by the General Election Committee). Enkhbold has spent his lifetime in Mongolian politics. He started as an economist and worked his way up to the chairman of the Parliament, a position he gained last June. As a lifetime politician, he carries a mixed reputation in the Mongolian public. While he is known to be one of the highly educated, experienced, and knowledgeable politicians within the MPP, during his tenure as mayor of Ulaanbaatar from 1999-2005, he was plagued by rumors of bribery and corruption in land reforms and housing projects. Although these allegations have not been confirmed by the law enforcement, it creates an anti-MPP sentiment from the opposition parties and the public alike. On the other hand, Enkhbold has been involved in important decision-making roles for the party, Parliament, and the overall stability of Mongolia’s multiparty, parliamentary governance. Plus, the MPP’s landslide victory in the 2016 parliamentary race raises a speculation that current chairman of the Parliament of Mongolia, Dr. Enkhbold has a greater chance for office. While his background presents rich experience in business, management, and politics, since 2014, the politicization of an economic policy has created a quarrel between him and current President Ts. Elbdegdorj. Following the quarrel, a swing of populist mentality hit the Mongolian public, which called on the government to enforce balanced economic policies toward China to prevent economic dominance. In line with this trend, in 2013, Battulga’s MDU and his factions helped to withdraw legislation that supported land utilization and leasing by foreign residents. Hence, some may view Battulga as a populist leader who will protect national interests and the national heritage, whereas other may view him as a typical oligarch from the 1990s. Both Enkhbold and Battulga will have to convince the public that they have the qualifications and problem-solving skills to tackle pressing issues. As informal online survey conducted by the author in April 2017, the “Pressing Issues in Mongolia” survey, highlighted issues in governance, the economy, foreign policy, national security, unemployment, and justice as the main themes. According to the 67 respondents and 20 individual comments, the public is highly discontent with the legal system of Mongolia and demands economic stability, employment opportunities, and healthy air quality for the younger and future generation. During the upcoming presidential debates, these questions and many more will be raised by the public, and the answers must comply with real life government policies and future goals. Meanwhile, the constant switching back and forth between the DP and MPP have some demanding a third party influence in Mongolia’s political sphere. As Mongolia becomes a significant player in the Far East, its presidential election is a fundamental time in shaping the future of modern Mongolia. As a newly emerged democracy, Mongolia’s fifth presidential election should further strengthen good governance and outward-led economic growth, while maintaining national sovereignty and national interest. Election 2017: Making Mongolia Great Again?On the Mongolian Campaign TrailA New Cabinet for MongoliaAfter Anti-China Campaign Rhetoric, Mongolia’s President Congratulates China on National DayWill a Battulga Victory in Mongolia’s Election Mark a Shift Toward Russia?